Rathlin is great for walking. The roads are, mainly, well-surfaced and they aren’t too busy. You can also walk off road in permitted areas. Sometimes groups combine a walk with a journey on an island bus. You can book a walk for any time of the year, though Rathlin gets most of its visitors between April and October. The map shows some walk options. Paul offers them all but details of the three most-popular are given below. Paul is offering a series of regular Saturday and Sunday walks, June to August inclusive. These are sure to appeal to all, including families. Book your place on the 09:00 ferry from Ballycastle (returning on any after 12 noon sailing). You can contact the ferry office on 02820769299; fares additional to walk cost. Meet Paul at the Ferry office. On arrival on Rathlin we start at St Thomas’ Church, located on the shore, before walking at a gentle pace to Mill Bay. Lots to hear about island life and wildlife as we go. We turn at Mill Bay and finish our walk close to the pub, Boathouse Museum, Island Treasures, Manor House, Co Op shop, Watershed Café, Breakwater Studio, Ice cream van. After your walk, your guide will be happy to make suggestions as to how to spend your remaining time on the island. Duration about 90 minutes. Cost £8 adult; £5 5-15 years; free under 5s. Please note that advance booking is essential by calling 07745566924 or email paul.quinn33@hotmail.co.uk. All on surfaced roads, at a gentle space with few inclines. 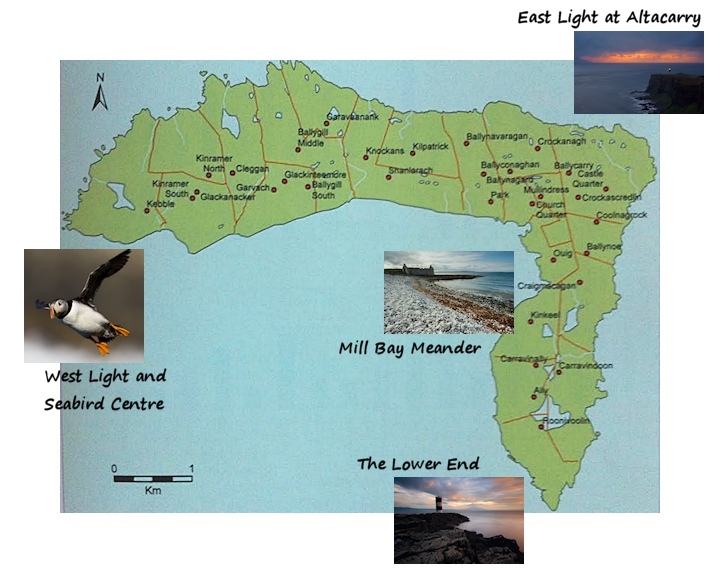 Expect to see Seals and Shorebirds (perhaps Curlew, Oystercatcher and Herring Gull). We will pass old buildings and hear their story. Shipwrecks didn’t just happen in the days of sail: you will hear about HMS Drake, sunk in WW 1 and a ship wrecked as recently as 29 January 2007. The walk lasts a bit more than an hour and children are welcome. Find out what it is like to live on Rathlin today. How are children educated? What if you suddenly get sick? What’s the chances of getting a speeding ticket? What jobs are important? This is the most-frequently requested walk. By “The Lower End” we mean the part of Rathlin that points south, towards Ballycastle and Fair Head. It’s called that because it is lower in elevation compared to the other portion. That larger portion points west and is referred to as “The Upper End”. A stream, entering the sea beside St Thomas’ Church, forms the boundary between the two Ends. On a combination of surfaced roads and designated trails. Different routes available; please ask. If you walk to the Rue Lighthouse through the spectacular cliffs at Roonivoolin you will be covering about half the island. Keep your ears open to hear the distinctive call of the Chough: an island bird rarity. Altacarry or Rathlin East Lighthouse is another way to go. Sorry, you can’t get to see round the East light. If you visit the RSPB Seabird Centre (other end of Rathlin), you will be able to see inside that Lighthouse. Hear the tale of Robert the Bruce or stories of the many other battles fought on Rathlin. You could hike towards the lonely Coastguard Hut, looking out for Buzzard, Raven and Peregrine. This walk lasts around 4 hours, be prepared to get muddy at times, unsuitable for children. This walk is a firm favourite. The walks are on a combination of trails, clifftop and surfaced roads. This offers a good chance to cover many parts of Rathlin. In late Spring see Orchids and maybe the rare Pyramidal Bugle (a favourite of Paul’s). This walk will last 7+ hours, but at a relaxed pace. It is sometimes combined with a bus journey, which is at additional cost and subject to availability. With the time at our disposal we could visit all three of Rathlin’s lighthouses. Plenty to see, lots to chat about. Not for children, this walk is for active folk.